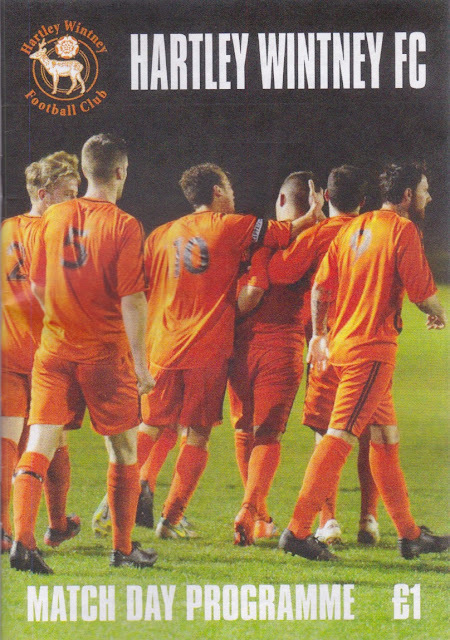 Hartley Wintney were on a fantastic FA Cup run and had beaten higher league Clevedon Town down in the west country 4-3 on Monday, so I was intrigued to go and see what it was all about. They had to battle through the rounds right from the start, at the extra preliminary round in mid-August. A 1-1 draw at Hellenic League Kidlington was followed up by winning the replay 5-2 at home. Next up in the Preliminary Round they defeated fellow league side Badshot Lea on their own patch, this time 3-2 without needing a replay. It was another opponent from their own league that stood in their way and after drawing 0-0 at home, won 2-0 at Camberley. In the next round, their most incredible result yet. They travelled to Ryman Division 1 South side Eastbourne Town and trounced them 5-1, despite being a division lower. Then last of all they hosted Clevedon Town, again from a higher league, drawing 1-1 before winning the replay 4-3 on Monday night. They now face one more game, against Daventry Town who are also a league above. If they win that then they have the chance of pulling any League 1 or 2 side out of the hat. It will be easier said than done. Whereas the 2 previous higher sides have been struggling, Daventry are absolutely smashing their league, winning every competitive game bar one this season. For either side to make the first round would be special, but for someone from step 5 of non-league, like Hartley Wintney, it's very rare to see them get that far. I had originally been planning to go to Bristol Rovers today, along with a nice cider tour of Bristol. But I'd had a few last night, partly in celebration that my video of the Harrogate Railway announcer had got on national TV, on the excellent Baker and Kelly VSPO show on BT Sport. They have all sorts of weird and wonderful football related things on there, I thought that would be right up their street and it turned out I was right. I woke up the following morning and really didn't feel like going to a ground that I had been to several times before. Especially as I had been spending a fair bit lately and was also really enjoying my groundhopping. So I started to look around for fixtures. The FA Trophy games were considered, games at Kettering and Coalville. But that would defeat the object of saving money, as it was still a fair old trek. So I looked in the FA Vase, and the 2 nearest - Oxhey Jets and Reading Town held limited appeal. For 10 or so miles further, I could go to Hartley Wintney which had far more appeal. I saw my Mum and Dad off who were off to see Wycombe play at Bristol Rovers on the independent supporters club coach. I then had myself a bath, got dressed and wrote out my blog for one of my latest groundhops at Farsley on Wednesday. After watching a bit of TV and chatting online I got myself a bit of lunch and left the house at 12.50. I stopped at ASDA on the way to get some Irn Bru for the game amongst other things, and was away from there by 1.25. It was a fairly short drive to Hartley Wintney and I parked up nearby to the ground at around 2.05. I had done my research on my CAMRA app and found that there was a pub serving real cider in the town, called the Waggon and Horses. I always like to support these type of places and shun the places with no imagination, because as I see it, when I go out, if I am paying a premium I want something new that I have not had before that I can't usually get at home. They did Westons Wyld Wood which I had tried before, but I thought I may as well have a pint while I was there, as it's not that common. The pub was a strange one, really small and everyone seemed to know each other. I felt like a bit of a stranger really, with everyone keeping themselves to themselves. I find you get that less up north, where people are more outgoing. Anyway, I enjoyed and finished my pint, and made my way to the ground, getting there about 2.35. I paid my entry fee and also got an excellent value programme, well presented and full of interesting things to read about for just £1. I will be reading that later as it contains some stuff about their FA Cup run which interests me. For a fairly small audience, it's pretty impressive, clubs higher up the pyramid charge twice that for a lot less content. For the 20 minutes before the game, I took some pictures and checked my phone, though not very quick as the signal was a bit iffy for the internet. Today's visitors were Petersfield Town, who were having a very good season in the Wessex League, a fact that I learned from their matchday programme. This is another decent production and is available for free download on their site. They play at the delightfully named Love Lane, another ground that I have been to for pictures on the way to a game elsewhere. Their interest in the FA Cup this season had ended at local rivals Horndean, their only defeat so far this term. Yet they were still only mid-table in their league, thanks to the fact that they had only played around half the amount of games that their rivals had. They'd already beaten Welton Rovers and Fawley to get this far in the Vase, entering earlier than the home side due to the fact that they played a level lower at step 6. The game started at a huge tempo and within the first couple of minutes, the home side were 1-0 up thanks to a long-range shot deceiving the Petersfield keeper. I thought it looked like it could be a long afternoon for the visitors, not knowing their record this season at the time of the game. I soon changed my mind anyway, as they were back on level terms within 5 minutes when their number 7 Mike Asare dribbled through the area before finishing well. He was the best player on the park and could easily play a couple of levels higher I reckon. And the game was turned on its head a few minutes later when their number 4 drilled a shot into the bottom right-hand corner to give them a lead. Keeper Matt Short was perhaps lucky to escape without being carded on a couple of occasions. Around the 20 minute mark he charged out of his area and bought down at Hartley Wintney forward, but despite protests from the home side, no other action than awarding a free kick was taken. From then on though, Petersfield were the better side and as they went in for the halftime break I was left thinking that Hartley Wintney would have to up their game if they wanted to progress in the FA Cup. Maybe it was the workload of that run that was getting to them, as the second half started in much the same fashion. That was until the 55th minute when Sam Argent tapped in from close range to equalise, From then on it was mainly Petersfield on the back foot as the home side seriously improved their game. They were ahead 2 minutes later when Stevens got another, this time a lovely lob over the onrushing keeper. They got their 4th around 10 minutes from time when from a cross Shane Hollamby wrapped things up. There was only going to be one winner from then on, and only the bar prevented the home side from adding to their tally. It had been a decent game, with 2 very good sides battling it out for progression to the next round. In the end, being a league higher and the extra class won the day for Hartley Wintney, but I fancy Petersfield to be joining them at this level next season, especially if they can keep hold of some of their better players like Asare. After the game it was a short walk back to my car, then an easy drove home with me getting in just before 6. It was to be the last late night of my week off and I looked forward to watching Match Of The Day without worrying about being up at 4am the next morning. I was also very pleased to see that Wycombe had won 1-0 in their game at Bristol Rovers, a place that has not always proved a happy hunting ground for us. Talking of the clubhouse, this is the main hub of the stadium. It has big screens and Sky and a very good selection of drinks (cider wise at least) for a clubhouse. Food is also served from here, and although I didn't have anything, there looked to be a good choice. Club shop wise, they sell badges and polo shirts, but not much else. I am wishing them luck in getting through in the cup, maybe they will bring out more then if they draw a big team. In any case, I enjoyed my visit here, the football was good and the atmosphere was friendly.